Introducing RESPeRATE, the interactive breathing device used by thousands of men and woman nationwide to gain control over high blood pressure. 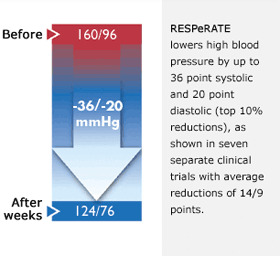 Used for just 15 minutes a few times a week, RESPeRATE delivers a significant all-day blood pressure reduction. RESPeRATE is a portable, computerized electronic device that guides you through sessions of interactive, therapeutic breathing powerful enough to lower blood pressure. Step 1: The respiration sensor monitors your breathing. Step 2: The RESPeRATE computerized unit composes a personalized melody with prolonged inhale and exhale guiding tones. Step 3: Simply listen to the melody through the headphones and synchronize your breathing. By prolonging the exhalation tone RESPeRATE guides you to slow your breathing and reach the "therapeutic zone" of less than 10 breaths per minute. Using a breathing sensor, RESPeRATE automatically analyzes your individual breathing pattern and creates a personalized melody composed of two distinct inhale and exhale guiding tones, delivered through comfortable earphones. Simply listen to the melody through the headphones and synchronize your breathing to the tones. By prolonging the exhalation tone RESPeRATE guides you to slow your breathing and reach the "therapeutic zone" of less than 10 breaths per minute. The physiological result? The muscles surrounding the small blood vessels in your body dilate, and relax. Blood is allowed to flow more freely, and pressure is directly, significantly lowered. Scientific evidence has shown that structured therapeutic breathing, if performed without an effort or particular concentration, can significantly lower your blood pressure. However, these effortless therapeutic breathing sessions are difficult to perform on your own without years of training or continuous, individualized coaching. That is why RESPeRATE was developed. To deliver effortless therapeutic breathing without any prior training, RESPeRATE utilizes a patented "Interactive Respiratory Pacing" technology, which ingeniously takes advantage of the body's natural tendency to follow external rhythms. Within 3 to 4 weeks of use, a significant, all day reduction in blood pressure can be achieved. And while your breathing returns to normal after each session with RESPeRATE, the beneficial impact on your blood pressure is cumulative. Bottom line: with regular use of RESPeRATE, measurable, sustained reduction in blood pressure is achieved. Whether you are already taking anti-hypertension medication or still trying to lower blood pressure with diet and exercise, RESPeRATE might just be the tool you need. Seven clinical trials repeatedly found RESPeRATE to be safe and effective for people with high blood pressure, either medicated or unmedicated, male or female, younger and older. One particular study, published in American Journal of Hypertension, even found that RESPeRATE delivered significant blood pressure reductions for people who had uncontrolled blood pressure despite taking three or more medications at maximum dosage. RESPeRATE device, respiration sensor, headphones, user manual, and 4 AA batteries. Please Note: RESPeRATE should only be used as part of your overall health program for achieving blood pressure goals, as recommended by your doctor. RESPeRATE can be safely used in conjunction with medication and lifestyle modification such as diet and exercise. While some reviewers appear to enjoy using this product and get good results, I wanted to balance these positive reviews with my own experience. In my case, I tried using this for a couple of weeks, but the 15 minutes that you are supposed to use it came to seem like an eternity of boredom. I would sometimes check the time thinking that 15 minutes were up, but find I was only 3 minutes into the routine. You listen to a very repetitive tone sequence, which I found soon grated on my nerves. I doubt that it would help my blood pressure once I found it so annoying. It would probably be much better to just relax and listen to music that I enjoyed. 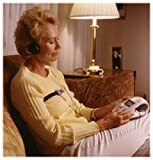 In fact, the clinical studies of this device showed that listening to music (the control condition) accomplished a substantial fraction of the reduction of using this device. So, this does seem to work for some, but you can probably judge your own personality as to whether you could enjoy listening to a repetitive tone sequence 3 times a week for the rest of your life. I am giving this only 1 star as it cost a lot to find out this didn't work for me and there was no return policy after one month. I have been using Resperate for 2 weeks and when I use it my BP falls anywhere from 20-40 points. I use it 2-3 times each day faithfully. That is key to good success with Resperate. You must use it every day for best effects. It also is great for reducing stress. I feel much better physically after using it. Ask your MD if it is for you. You should use it as part of an overall program to reduce BP: lifestyle modification, diet, exercise, stopping smoking, etc... It should not be the only thing you use. The cables cost about 20 bucks, but it is worth it to have a back up copy of the recordings. Then when all is connected, just sit back and do a session of Resperate and record it on your computer. Then burn a cd and you have a copy should anything happen to your resperate unit. Just got this today, so this review won't be about the long term results, but rather what happened the first time I used the product. (I'll update after I've used it for 6 weeks). Anyway, I've been averaging probably 125/85 up to 135/100, depending on my stress level. My doctor has had me tracking my BP for the last month. Before going on medication, I wanted to try this. Tonight, I took my BP before trying it... 125/85. After using Resperate for 15 minutes, I felt very relaxed. Walked back into the living room and sat down, then took my BP and was surprised to see it at 107/75. I wish that I had read the reviews here at Amazon before I spent the money on a Resperate Machine. This machine is the biggest waste of money I've seen in a long time. The company would not give me the free shipping promised in the newspaper ad so I ordered from Amazon. I complained about the limited 30-day warranty but was told it would ONLY take 3 - 4 weeks to see any results. Since I have many problems with most BP meds, I was dreaming that this might actually help! My spouse & I tried it for a month with NO results & left on vacation [no time to send it back]. When we got back we tried it for another month -- my BP went down slightly, his actually went UP. I asked the company about that and also about whether we had to use this thing for ever. I never got a reply. I repeated the questions on their forum -- still no answers. I found this exercise exhausting, frustrating, & boring because the stupid thing does NOT breathe WITH me [now my BP is UP too], and I cannot possibly breathe as it directs me [panting like a dog!]. My husband complains about the same thing. I would advise people not to waste their money. One reviewer (who obviously hasn't purchased or tried it out) said he wouldn't reccomend it without seeing the clinical trials. A good point, BUT with a few clicks I was able to find copies of 6 of the 7 clinical studies... PLUS many peer reviewed medical journals that had articles that were NOT written by "employees of their company". I have not used this machine but will base my opinion on the use of a blood pressure monitor that I purchased when my blood pressure suddenly shot up to 170/100. I think this was due to food poisoning. Anyway my blood pressure had always been pretty low, approximately 105/65 when I was in my 20s to 30s and about 125 to 135 once I passed 45. After the food poisoning incident, I purchased a blood pressure monitor from Wal-mart to watch my blood pressure. One day, when I sat down to take my blood pressure, I had a really exhausting day. I was pretty tired and decided to relax myself by taking a long slow deep breath in through my stomach and an equal amount of time exiting the breath through my stomach. I then did the reading and my blood pressure was 106/64. Was this a coincidence or was it because I had taken the deep breath? I did one long deep breath several times again within the week just before I took my blood pressure and each time my pressure was lower than normal. I started doing deep breathing once or twice a day when I wasn't using the monitor (2 to 3 long deep breaths in through my stomach and out through my stomach) after which I always felt more relaxed. My blood pressure has stabilized to approximately 115/70, I think this is a direct result of the deep breathing exercises that I do during the day. The RESPeRATE blood pressure monitor seems to be a good machine and after reading the reviews, it sounds like a meditation or biofeedback machine. I think the RESPeRATE blood pressure monitor is an excellent machine for someone that needs to be taught slow deep breathing exercises through the stomach, but if you can't afford this machine or find it difficult to sit for 15 minutes a day, try an inexpensive blood pressure monitor and practice on that. Same concept. If you're breathing right, the monitor will reflect it. If you're excited or agitated, or your blood pressure and heart rate speeds up whenever a doctor takes your pressure "White Coat Syndrome," the RESPeRATE machine may help you to remain calm in all situations. I had considered this product a number of times but sat on the fence because of the price. A recent increase in my BP, despite taking the usual steps to lower it, required an increase in my medication which stabilized but did not lower it. I made up my mind then to try RESPeRATE. After a month of daily use, my BP as well as my resting pulse rate have all lowered. The machine is easy to use and requires only 15-20 minutes per session. I also find the routine to be meditative and relaxing. I recommend finding a quiet place to use it with no distractions or interruptions. This product does work! I have a family history of HBP, and although I am in my 20s, excercise daily and eat right, my readings are climbing into the 140s/90s zone. I am pregnant right now, and I know that HBP is very bad during a pregnancy. So, I looked into Resperate. Since I started using Resperate (about a month) my blood presure has dropped about 8-10/8-10 pts. I am hoping that this trend continues. I use Resperate AT LEAST 4 times a week--I try for 5-7 times a week. A sample of the RESPeRATE was given to the internal medicine practice where I worked at the time. It DOES take "getting acquainted" to learn how to use this. You must actually read the manual to gather it's operation. Once you get oriented, it is pleasant-and effective-when one is RECEPTIVE to what the device is supposed to do. If an individual has issues with labored breathing for any reason, it will be a challenge to use (albeit a very soothing one). You are to breathe along with the preprogrammed music of your choosing (there are a handful of melodies), and the music gets slower and slower. The change of tempo is influenced by the feedback the belt around your waist gives the machine. You will be challenged to breathe REALLY deep and REALLY slow. I mean, like, master yoga practitioner slow!!! Challenging. Doable, but challenging. If you do it and keep with these exercises in breathing, you WILL be better for it. I want the reader to clearly understand that although this machine is very very soothing to use, it is not to be mistaken for a luxury item or a toy relative to addressing your health. It takes time-daily!-and receptivity to its relaxing powers to obtain tangible results. The RESPeRATE will teach you the good HABIT of healthy breathing while lowering your blood pressure if you actually use it. Big expense, but you'll spend the same on a year of copays for your prescription drug. It qualifies as a reimbursable expenditure if you have a flexible spending account. If it's about the end of the year and you still have funds in your FSA, go for it! First of all I'd like to say I'm really very pleased with Amazon.com with their prompt response to my complaint that the first Resperate machine that I received wasn't working. They immediately sent a replacement which arrived the next day after my complaint. And I was instructed to have the defective item ready for collection by UPS - at no extra cost to me, not even the shipping & handling of the defective item nor of the replacement item. I don't know why, but Amazon never posted my review, so I will try again. First let me say that I am in no way affliated with InterCure, the maker of the Resperate. I am just an average person who was looking for a way to lower his blood pressure without using drugs and enduring their dreaded side effects. To make a long story short, I was desperate to lower my blood pressure. It was peaking at 150/100 during the most stressful part of my day. Well, after using the Resperate device for about 2 months, my blood pressure has dropped to an average of about 115/75! I have not experienced any side effects. But, there have been some additional benefits, such as improved sleep,mental clarity, and stress relief. For 25 years I was besieged with uncontrollable High Blood Pressure. This Resperate solved my problem and SAVED MY LIFE. Before I found Resperate I spoke to doctors about my situation and it seems like alot of them just want to pound your body with pills without realizing that there are other ways to lower blood pressure, and in the meantime people die because they don't know about Resperate and that's a shame. First of all let me start with the negative: I believe this product is over-priced, especially in order to reach the elderly and poor people. This is a product that can spread by word of mouth. You're not going to get everyone to buy this product at $300 and probably not for $200. I believe that other products like this will be out soon, because this product really works! I was skeptical of this item and I told my doctor about it and he smirked at the product, another told me breathing really had nothing to do with my blood pressure. I am glad I didn't listen, but the price sort of held me back. Pros: My average blood pressure was ranging from 150/81 to 160/90 on a regularly basis. I immediately saw a drop upon my first use. I was originally using the device 2-3 times a day, just to see if it worked. The second week of use my BP was averaging 140/90; Third week 133/85 and this week I have gotten readings below 120/80. I am going to the doctors this week and due a 5-day check from my doctor and after that schedule an appointment to discuss the item he smirked at earlier. Bottom line, I would strongly recommend buying this product. Buy it now if you can afford the price. I think everyone with high BP should try this device, with the amount of money out there with the drug companies; this is a way for RESPERATE to come through the back door, but not at this price. It lowered my blood pressure sometimes. At the doctors office I had a blood pressure reading on 12/05/05 of 148/82 and on 1/05/06 of 167/80. I started using Resperate on July 2006 at least 3 times a week. I have gotten as low as 125/75 but in the morning it can go to 160/88. I jog 3 miles everyday and use statins and a blood pressure lowering drug. I am 67 years old. There are a lot of good reviews here on Resperate. A number of them sound so good they could have been "placed" here by the manufacturer. Look, I have no doubt that Resperate will make a reduction happen for many people who use it, because the idea is sound. It's based on good science-that meditation reduces blood pressure readings. But let's take a look at what you get here. This is basically a $30 Chinese CD player being sold with a built in "tune" for $300. It is NOT a quality product. I used it for two months, got a small reduction in my blood pressure readings. But the first unit I received was defective within a week, and the second one looked like it was going to have the same problems. Physically, it is not made well. It's chintzy. And when I spend $300 for an electronic device, MAN that thing had better be cool, and really made well. In this case, the little plastic piece that has the digital readout on it came off, the earphone jack had to be held in only a certain way in order to work, and the cheazy little monitor thing that goes around your chest is actually hard-wired right into the case, which is crazy because it is prone to shorting out. So, in short, you'd have to be really nutty to keep this thing after the 30 day evaluation because its "self-destruct" mode starts kicking in about then. The company has a great $100 product here, but they put an extra $200 into the retail price so that they could promote the heck out of it. Even the headphones that come with it are so cheaply made that they fall apart faster than the units that they give away in airline seats. After reading about it in a magazine, I bought this product as a gift for a dear friend. She has high blood pressure, can't tolerate any medications, and is not exactly handy with electronics. I love this devise. I bought the duel machine so that it would keep track of both my boyfriend and myself. I am in my early 40's and he is in his late 30's. We are not over weight and we do exercise regularly. But still both of us had prehypertention/stage 1 hypertention. Within three days my blood pressure had gone down to normal levels! 3 days! The directions say it takes 3 to 4 weeks to see a difference but mine was much quicker. I started by using it every day to get in to the habit but now am using it 3 times a week as suggested. My boyfriend's progress has been slower but it also brought his blood pressure down within the first week. The proof's in the pressure! Alright, I haven't used this personally. But I witnessed a most impressive display of its powers today in my clinic. My seventy-something year old patient is very interested in doing whatever it takes to improve her health. In the blood pressure department, that includes three different medications, one beta-blocker plus Lotrel, a two-fer drug that combines an ACE inhibitor and a calcium channel blocker. Easiest way to relax in the world!!! I bought one of these about two years ago. I have been on 30MG Lisinopril for years and the pressure was once again creeping up into the 150's. Since I began using this device on a regular basis, I can not remember the last time my blood pressure was over the 130's and it is often in the 120's. (I have never had a problem with the diastolic pressure but it has dropped as well). I tried this because I wanted to see if I could lower my blood pressure enough to stop medication that had unwanted side effects. I'm still on medication. However, the device has helped me get to sleep and sleep better. 1) Over 5 day period, prior to using Resperate, I took my blood pressure twice a day, and averaged the scores. This was my baseline: 115 over 89. 2) I used Resperate 15 mins. every day, prior to going to sleep. While the timed breathing seemed easy, it still required a little concentration. I consistently had breath detection and sychronization scores over 86%. My beginning breath rate averaged 8 and ending rate was 5. 3) I continued taking my blood pressure as above, and always prior to using the device. Pressure readings fluctuate even within the same minute, so I took three readings and averaged them whenever I measured it. I tracked the daily pressure on a spreadsheet. RESULTS: During the first 30 days, results seemed impressive. Graphing the slope of all the daily points, the final point was 106 over 81. I continued every day, but the pressure went back up. Was this a placebo effect? Over the next month, pressure again fell, but not as low. Overall average after 60 days: 111 over 84. Systolic dropped 4 points, Diastolic 5 points. This was not like the dramatic results described on their website. I would probably sell this device except for an unanticipated side effect: better sleep patterns. I have had difficultly getting and staying asleep, using medication about every 3 nights. I have only taken sleep medication once since beginning Resperate. I also saw they dropped the price on the Resperate website, so if you want to try it, you might investigate there. FINAL NOTE: If you are diabetic (I'm not), there's clinical evidence that this approach has a low probability of working for you. I saw no reference of this point on their website. My Resparate works great, and is helping significantly. It is a good product. Customer support is good. No problems yet, but after years of use some parts may need to be replaced. This is a relaxing and effective way to maintain BP health. Seven clinical studies establish its effectiveness, and it is working for me.